Brian, you need something like exhaust opening at 50 degrees before BDC and closing 30 degrees after TDC. John---50 degrees before bottom dead center? That sounds like an awful lot to me, but I will try tomorrow night to translate that into approximate piston position. Cam design is an extremely complex science and far too involved to get into here so for the sake of simplicity here's what I can tell you. What you have described would be known as very mild cam timing and should work fine for a hit and miss engine. Normally on a 4 cycle engine with both valves operated by the cam the timing would be different and calculated by the working rpm of the engine. Here again for the sake of simplicity the exhaust valve should open around 30 degrees before BDC. By this time the fuel charge has done it's work and with the valve opening at this point is allows the exhaust gases to get a head start on exiting. Now the piston is heading toward TDC. About 30 degrees before TDC the intake starts to open. The reason for this is to allow the moving exhaust gases to help pull the intake charge into the cylinder. Now the piston moves past TDC to about 30 degrees and the exhaust closes. The reason for this delay in closing here again is the scavenging effect of the flowing exhaust gases and the fact that in 30 degrees of crank rotation there isn't much vertical movement of the piston. Now the piston is headed back to BDC with the intake open. It stays open about 30 degrees past BDC so that the inertia of the moving air/fuel charge has a chance to fully fill the cylinder. As I said these numbers are only approximate due to the many variations of engine design, but you get the picture. 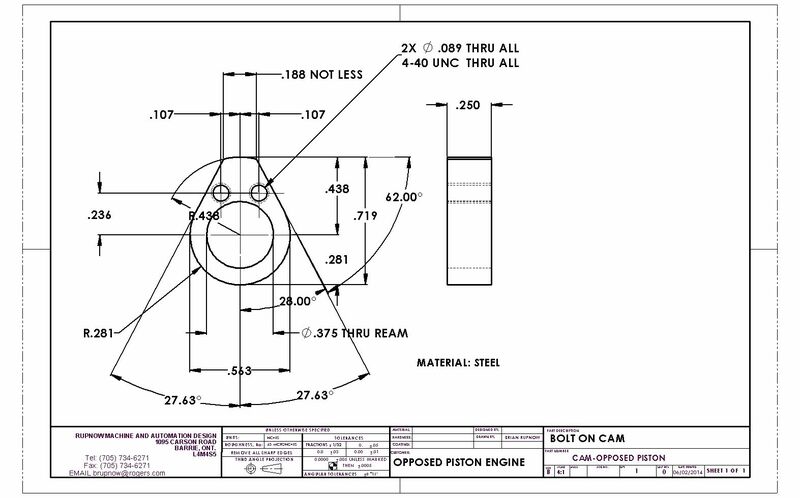 I thought of using my cad program to see what angle of advance the valve opening would have if the piston was 1/8" from BDC last night, but was away on a job all day, and didn't have a chance to look until tonight. The engine rotates clockwise, and as you can see by the dimension on the drawing, the piston is 1/8" from being at bottom dead center. The angle of the crankshaft shows that this is almost spot on 50 degrees advance. Looks like John was "right on" with his advise!!! On an engine which has a mechanically operated intake valve, I can see the reasoning for having the exhaust valve remain open for a portion of the intake stroke. On an engine with an atmospheric valve, I would think the exhaust valve should close right at top dead center. If the exhaust valve begins to open 50 degrees in advance of bottom dead center, and closes at top dead center that's a total of 180 +50=230 degrees. Now the cam revolves at half the speed of the crankshaft, so I think that translates to 115 degrees of "cam influenced movement" of the valve.--Stick with me folks, I'm winging it here. The cam rotates thru 360 degrees, so I think that means there should be 360-115=245 degrees of cam which should not be influencing the movement of the valve. (valve is closed when not being influenced by the cam). 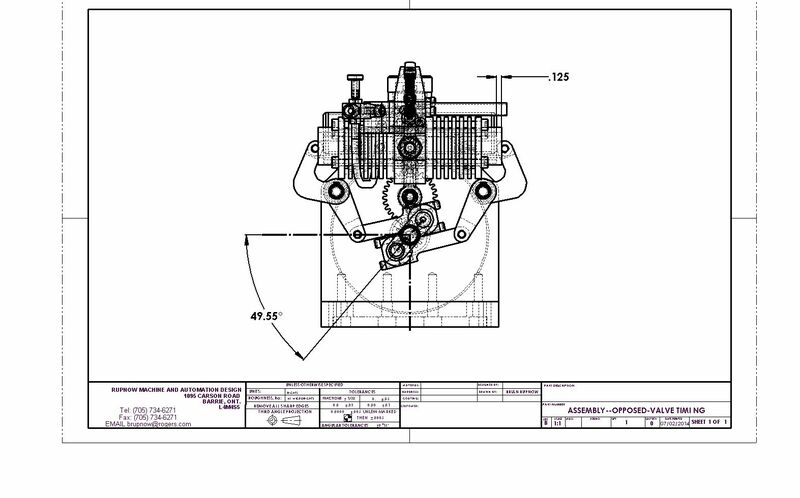 The drawing of my cam shows that the angle is about 235 degrees of cam which is not influencing the valve. So--what I have is pretty darn close. I am not sure of my reasoning here, but would a 10 degree difference make that much difference?--And am I correct in my thinking that when using an atmospheric intake valve the exhaust valve should be closing at top dead center? I just got my feeler gauges out and checked, and found that my valve lash had slipped/changed to a whopping 0.023"!!! I am changing it to .005" to see what effects that has on when the valve opens and closes without changing anything else. Okay--That clinches it--There is something wrong with the machining of my cam, but not with the design of it. I set the lash at .005", and readjusted the timing so that the valve lifter just began to contact the valve at 50 degrees before bottom dead center, (which corresponds with the 1/8" of final piston travel before bottom dead center. I then rotated the crankshaft by hand until the piston began its travel up the cylinder on the exhaust stroke. The exhaust valve opened fully as it was supposed to--and then stayed open through most of what should have been the intake stroke as the piston travelled back down the cylinder. I have messed up the machining of the cam. I'm surprised that the engine ran at all. So--this weekend I will machine a new cam. I knew there was a reason I designed this engine to have a bolt on cam!!! Jeez--What a nasty little piggy to take the cam off of. I almost had to dismantle the entire engine!!! I can't really see anything wrong with the cam on visual inspection, but at this level there isn't really too much that would be visible to the naked eye anyway. Maybe if I had a visual comparator it would show up.--Oh well, it gives me a chance to clean up the engine. Yes massive duration on that from looking at it. I just measured the angle between the flat faces of the cam with my machinists protractor. The angle measures 57 degrees. It should be 55.2 according to the drawing. Re check Brian as 2 degrees will not cause the valve to stay open during the intake stroke. You are working half angles are you not ?? 10 degrees on a cam is equal to 20 degrees engine rotation because of the 2:1 timing gear ?? John--the problem seems to be that the o.d. 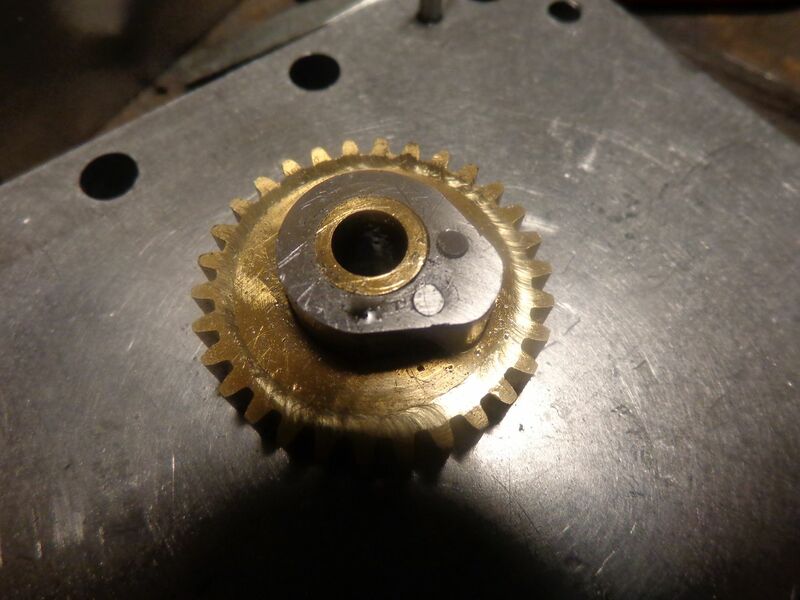 of the cam is not perfectly concentric to the center of the gear. I am taking steps to address this with the new cam. Maybe this will help, it's certainly a better shot of what a cam should look like. Yours has far, far too much duration. There is nothing wrong with Brian's cam duration. I did sketch it and verify in SolidWorks. His cam has 246° duration (crank angle) max with zero lash. The Nemmet has 260°. I did see your note here about what I assume is the base circle. If it is not concentric, it will require a large lash and reduce duration as I described on the other site. Well i must be missing something or what's quoted is incorrect. "The exhaust valve opened fully as it was supposed to--and then stayed open through most of what should have been the intake stroke as the piston travelled back down the cylinder." That is not caused by a couple of degrees or 8 thou error. Remember we can only go on what we are told. Right, but he measured 57° between flanks. If you assume the base circle is perfect that determines duration, and I do trust his ability to read a protractor. The only other possibility is as he describes runout on the cam and depending where that error in cam profile ends up easily explains what he's observed. 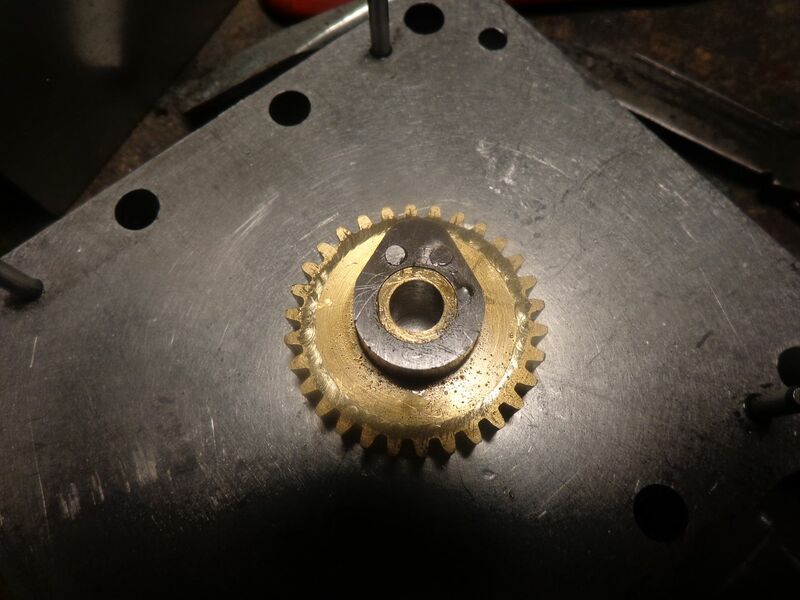 Tolerance makes or breaks assemblies, and cams are sensitive to it. Had the camshaft bore and base circle been made in one setup I'd question it as well. There are, however, several setups each introducing error, fact of machining. .008" error when lash is less than that will cause serious problems in cam actuation. 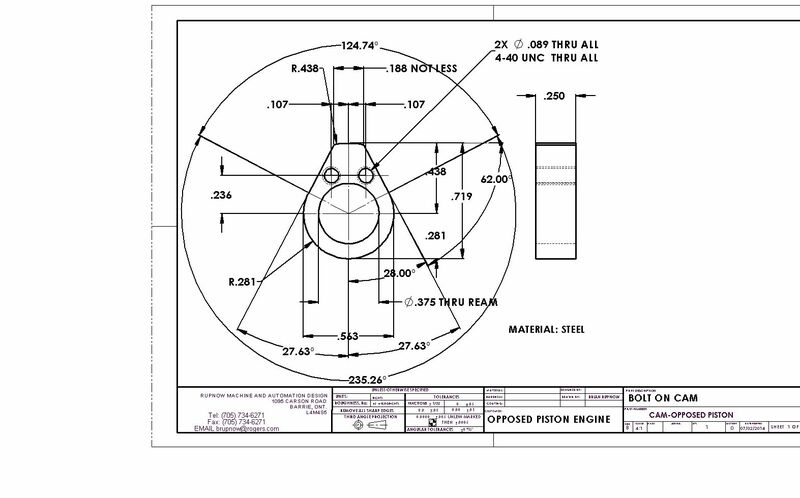 In the few production model engine cams I've inspected base circle error has been on the order of .0002". OK but I still think something is wrong with the information. Brian earlier says he had 23 thou clearance which would cancel out any 8 thou error and reduce the cam opening duration so where does the long valve timing event come from ? I think the .023" was observed due to being in a different place on the now known eccentric base circle. 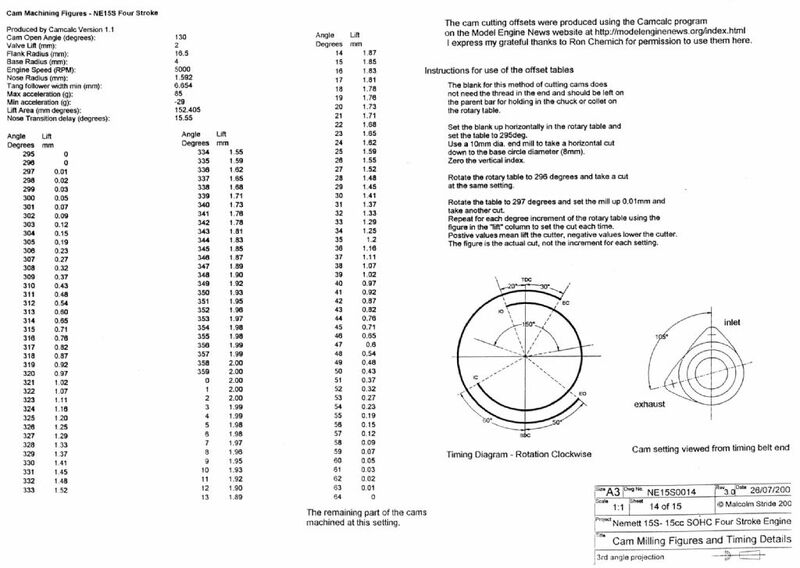 Just a hunch but if you look at the top picture of the cam lobe it does not look like the point where the lobe meets the base circle is centered on the base circle. The entire lobe appears to be shifted above the centerline of the cam. Visually it appears to have 360 degrees duration because it seems like it would start lifting at 3 oclock to 9 oclock. If you dont see it I can make a sketch after i finish eating my dinner. Very pleased to announce that everything is back together, and this time the exhaust valve really is operating exactly as it is supposed to. Begins to open at 50 degrees before end of power stroke (which is almost exactly 1/8" before piston reaches bottom dead center). Opens fully and stays open during exhaust stroke, and closes fully about 20 degrees into the intake stroke. Even with all of the mating surfaces on the plate framework located with dowel pins the engine has stiffened up a lot after complete disassembly and re-assembly, but I expected that to a degree. It is nowhere near as stiff as it was after first assembly. Before I try to run it again I am going to make a new adapter to go between the carburetor and the intake manifold. Right now there are two adapters in there, which I will replace with one much shorter adapter. I also want to do something about the routing of my gas-line so I don't have to resort to tying it up out of the way with a string, as seen in the last video.